Painlessly remove unwanted hair anywhere, anytime with Bi-Feather King Eye Brow Hair Remover and Trimmer that is designed specially for Women. This eyebrow hair remover and trimmer will effectively put an end to all your eye-brow hair removal needs.This eye-brow hair remover and trimmer allows you to effortlessly remove your eye-brow hair in seconds. The advance engineering of the product lets you have a professional finish to your eye-brows. This product is extremely user-friendly in nature as it allows you to easily manoeuvre it. You don't have to be a beauty expert to have your eye brow hair remover or trimmed. 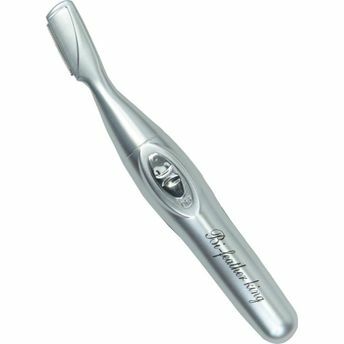 It comes with a cleaning brush for its maintenance.The Bi-Feather King Eye Brow Hair Remover and Trimmer is effectively lightweight, compact in design and is supremely portable. You can also effortlessly pack it in your handbag and use it whenever you need. Now, painlessly remove hair on the move. Move out of the painful hair removal process of threading, waxing, etc. and feel the comfort of using Bi-feather eye-brow hair remover.